The Tobacco Rustica we use has nothing to do with the tobacco for smoking that you'll find in the local store. For ceremonial use we work with pure tobacco from the rainforest. The dried leaves are fermented in the soil. 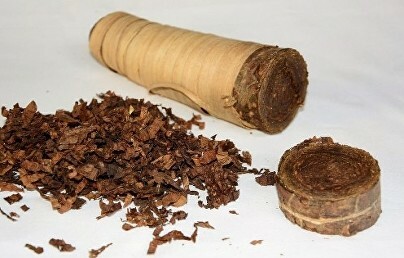 The end of the process gives a very strong and powerful tobacco. The shamanic use of this tobacco to smoke is known under the name: Mapacho. In the cacao ceremonies we do not smoke, but sometimes it is useful to blow smoke to clean the air from heavy energy or to calm the mind of someone. Tobacco smoke is usually used during the rituals of healing and purification. Tabbac smoke is also never inhaled, this is a custom that we have started to apply mainly in the West, but which has nothing to do with sacred ceremonies from different cultures. In our work and preparation with the sacred Tobacco we put the fermented leaves in pure water to rest for a day, so that the water can slowly absorb all its medicinal properties. When sniffing tobacco water through the nose, the total experience can only last a few minutes, while the experience of drinking the tobacco in other settings can continue for several hours. In the rainforest one also usually perform a thorough purification before stepping into a diet or other ceremony. A little bit of tabbac water is drunk and then a few litres of water. A thorough cleaning is what follows, called 'vomativa'. We recommend to take Tobacco slowly when it is taken through the nose, because this phase may be frightening for the first time, but soon it will be followed by a second phase in which the energy of the plant rises within the system. It might feel like you are being lifted by a wave of energy. Already at that stage the energy of the Tobacco starts to focus on energy blockades, while the consciousness is greatly increased, making these blockages easier to feel. Consciousness is then at the highest level and in this phase the removal of energetic blockades is also at its highest. With this phase the feeling of solidarity also comes up. It is as if the Tobacco lowers the barriers of separation. Then the energy of the Tobacco begins to dissolve slowly in the fourth phase until peace and quiet arise. This last phase is a state that is essentially the result of removing lower energies from the energy system. It is this phase in which people sink deeper into the body and a strong ground occurs. 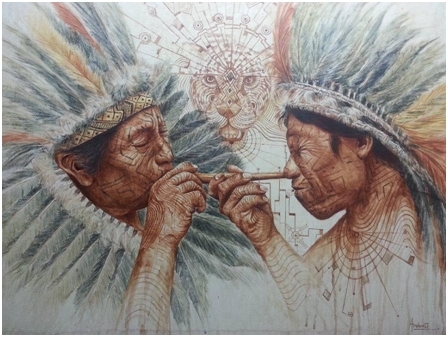 Tobacco snuff is a sacred shamanic medicine or tool, that has been used by tribes of the Amazon basin for thousands of years and is an essential part of their tribal culture and history. Rapé is the name for one of many of these snuffs, and it's foundation lies by numerous indigenous tribes in Acre, Brazil. Curiously, Rapé is not sniffed, snorted or inhaled. Instead, it is administered (blown) into the nostrils with a special blowpipe called "Kuripe" (self administration) or "Tepi" (another person administers). This "blow" is quite forceful and not specifically pleasant. It can be rather shocking. The appearance of a Rapé is a grey- to sand coloured, very fine and dry dust. It is traditionally prepared by ceremonial pounding of Tobacco (N. rustica) with tree ashes, followed by patiently filtering it through a fine mesh, resulting in a dust as fine as 125 micron. The varieties of Tabaco used are not the commonly known N. tabacum, but N. rustica, such as "Corda" or "Moi" and in cases also "Mapacho". Given the potency of the Tobacco, Nicotiana rustica, which is stronger and darker than Nicotiana tabacum, it can elicit mind alerting and grounding effects. A typical Rapé ceremony involves a mutual administration by two persons. The Rapé is blown high up into the nostrils with a pipe made from bamboo or bone. The intense blow immediately focuses the mind, stops the chattering, and opens the entire freed mindspace for your intentions. Furthermore, this helps releasing emotional, physical, and spiritual illnesses and eases negativity and confusion, enabling a thorough grounding of the mind. Likewise, shamans use Rapé to re-align with their energy channels and with their higher self, and to intensify their connection with the world and the universe. In addition, Rapé paves the way for detoxifying the body and cleans out all excess mucus, toxins, and bacteria, thereby, assisting in fighting colds and snuffles. Moreover, Rapé stimulates the mind with its nicotinic content that in turn releases a.o. epinephrine, acetylcholine, and dopamine, supporting an increased focus, presence, and intuition. Interestingly, there are many rumours that Rapé could decalcify the pineal gland(1), which is involved in melatonin secretion, circadian time perception, and drug metabolism. Calcification of the pineal gland has been associated with neurodegenerative diseases, such as Alzheimer's disease, and fluoride exposure, which further stresses the importance of a healthy pineal gland. Yet, whether Rapé can really help the decalcification of the pineal gland, is highly debated and needs still to be scientifically proven. For indigenous Americans, tobacco is medically used as a cure of certain diseases, sores, wounds, and as a defence against insects (Curtis 1935) and also as an analgesic and narcotic substance that eases fatigue, pain, hunger, and thirst (Elferink 1983). Rapé enters deep into the nostrils, thereby cleaning out any residual mucus and exerting potent antibacterial effects (Pavia et al. 2000). If the body is too congested with toxins, vomiting can be a side effect that leads to a thorough cleansing. There are even special Tobacco blends (Machiguenga snuff) that are made to counteract influenza and other diseases (Russel & Rahman 2015). Furthermore, the Tobacco that is contained in most Rapé blends can potentiate the healing capacity of other plants, like Ayahuasca. Moreover, in its original sense, tobacco is even a hallucinogen. It contains two alkaloids, namely harman and norharman, which are closely related to harmine and harmaline (Janiger et al. 1973). These two beta-carbolines inhibit monoamine oxidase (Herraiz et al. 2005), leading to antidepressive and stimulatory effects (Farzin 2006). Every medicinal plant is considered by indigenous tribes as a sacrament and as a prayer or intention. We recommend to use this sacred medicine, Rapé, in an environment that is honouring the plant for its teaching and healing abilities. Incense, crystals, chumpi stones, tribal music, and nature, create a perfect space for a meditational and reflective rapé use. Also, it is very essential to aim your mind and prepare an intention before embracing Rapé; sit in silence and aim your mind before you get started. This intention can be focused on insights, physical healing, energetic healing, or anything that necessitates healing or clarity in your life. Once you found an intention, ask the universe or the spirit world to help you through that process. Thereafter, the receiver deeply inhales the medicine, first through the left nostril, which symbolizes death. Afterwards, Rapé is applied to the right side, which represents rebirth. After the experience, it is best to remain with the eyes closed, while both inhaling and exhaling slowly through the mouth, enabling a thorough grounding and maintenance of focus. Try not to put your experience into words while grounding, rather try to concentrate on your thoughts and energy that is released by the medicine. Try not to fall into suffering or drama, but discover how easy it is to channel the experience into your heart, and notice the warrior power and grounding that provides, and how it rebalances you. Snot and mucus will be finding its way out: first through the nose, later as phlegm through the throat. It is very important to allow the outward flow, as the mucous and fluids will carry your physical and etheric waste with it, so one gets rid of it. Do not force it up, and do not swallow it. Simply just breathe only through the mouth after first application. Then when things have calmed down, softly breathe out through the nose. You will see powder coming out. You don’t want to inhale this powder in the lungs. After a while of breathing, it will start dripping and the nose can be cleaned. Ideally, this is done by holding one nostril closed with a finger, and emptying the other nostril forcefully, with a strong blow of air exhaled through the nose. When this is done with both nostrils, often several times, one can immediately feel a new and open access to fresh air, and breathing through the nose is greatly enhanced. After a while, the remains may drop back into the throat. It is important to bring this phlegm up into the mouth again and spit it out. This may need some coughing, but it is very necessary and rewarding. To be able to freely experience the cleaning process, it is best to be outside, where the phlegm can be spit onto the ground. This last process of spitting the phlegm, is a great final affirmation of the expelled negativity that physically and visually leaves the body and is given back to mother earth. If you continue to feel dizzy and unwell after using Rapé and eventually purging, it is recommended to drink some water, non-caffeine tea, or fruit juice and stay with your eyes closed, either lying or sitting. The water will hydrate your body and help remove all toxins that are still being excreted, and the natural sugars will support grounding.